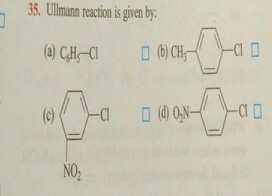 This question that I recently encountered asked what the most suitable substrate for the Ullmann reaction would be. The answer given is (b) but I think it has to be (d) as the nitro group acts as EWG and thus facilitates the reaction. However I do not know the mechanism and thus am not sure if (d) is indeed the correct answer. Any reason why the answer might be (b) and not (d)? I think that the answer given in your textbook is wrong as they are trying to conduct ULLMANN reaction on a chloride a strong EWD needs to be present at the ortho/para positions for the reaction to be feasible. 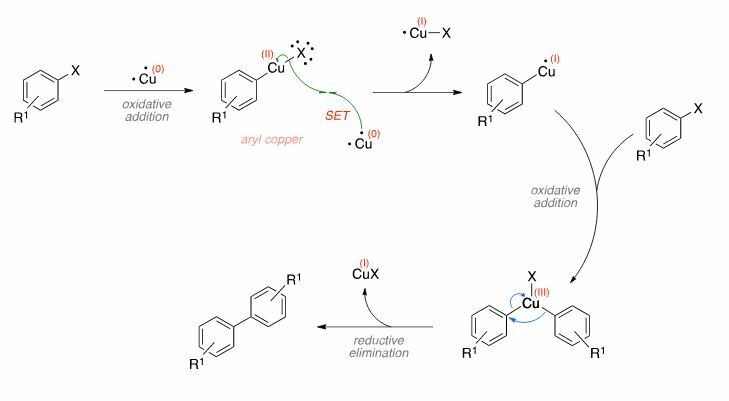 The Copper Metal (used as catalyst) Generate a Aryl Radical By transferring a electron, and then 2 Aryl Radical combine to form the final product. Acording to this a Organometalic intermideate of Aryl copper halide is fromed. The copper is added to the Aryl halide by Oxidative addition. then a electron is transfered to the intermidiate to for a organocuppric radical which again perform the oxidative addition on another aryl halide which result in formation of a biaryl copper complex which in turn undergo reductive elimination and make the final product. You can easily see that we need a EWG to make the Reagent more reactive thus making the reaction feasible thus your answer must be either wrong or you might have checked it wrong. nevethless I also find this paper affirming mine and your belief. Not the answer you're looking for? Browse other questions tagged organic-chemistry reaction-mechanism synthesis or ask your own question. Curly arrow mechanism for reaction between sodium borohydride and water? Why can't LiAlH4 react with alcohols? Are groups other than carbonyl reduced by Clemmensen reduction? How do you know if SN1 orSN2 reaction occurs when it is not so obvious?